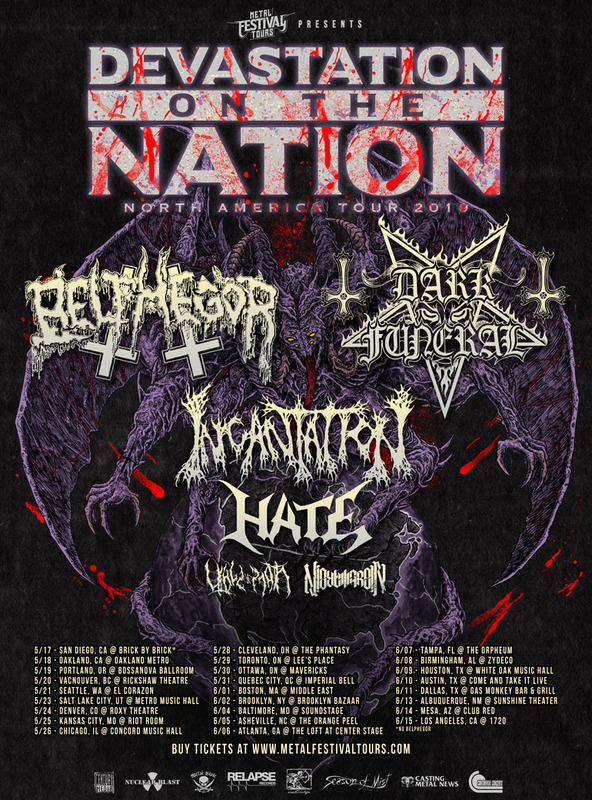 European diabolical death/ black metal troop BELPHEGOR will co-headline this year’s “Devastation on the Nation” Tour alongside Swedish black metal stalwarts DARK FUNERAL. Joining them are INCANTATION, HATE, VALE OF PNATH, and NIGHTMARER. BELPHEGOR‘s latest album, Totenritual, was recorded at Stage One Studios, Germany and Studio Mischmaschine, Austria. Over three years have passed since the Conjuring The Dead album was released. The new album was mixed by Jason Suecof and mastered by Mark Lewis at Audiohammer Studios, Florida. The artwork was once again created by Greek artist Seth Siro Anton, who also painted the cover artworks for Pestokalypse VI in 2006 and Conjuring The Dead in 2014.